nostalgia – Hi, I'm Caroline. I went into tonight’s blog certain that I’d have nothing more to leave you with than “This is me, checking in solely for the sake of not missing NaBloPoMo.” It’s been that kind of day. 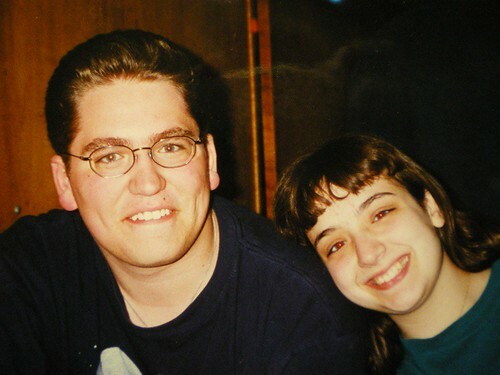 Yes, that’s hubby and me in June of 2000. First impression: Wow, we were young! Second impression: Holy CRAP, we were YOUNG! 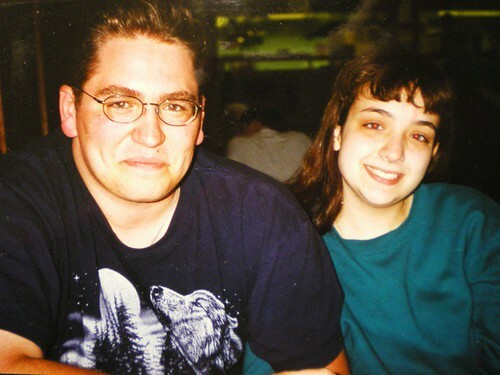 Once I got past the initial shock of realizing that my 24-year-old face looks nothing like my 17-year-old face (*cry*) I realized that, damn… we were cute. I mean, look at those bangs! Look at his dimples! These photos bring back lots of good memories. They were taken at Tim’s high school graduation dinner, no more than three weeks after we’d started dating, and only months before we started the long-distance portion of our relationship. It’s amazing we made it through the following year, being that we’d only known each other for a few months before he went off to college and I finished high school. This was around the time that Mr. Tim was oh-so-sure that I was going to be his wife someday. Because, you know, 18-year-olds are psychic like that. And crazy. But I suppose he wasn’t too crazy, because here we are. Happy, together. It’s satisfying to see how far we’ve come, how much we’ve grown up… and in some ways, these serve as a reminder of how far we’ve yet to go.